I’m not sure how old most of you are. But, the one thing I can guarantee is that we have all experienced a rough time in our own lives. Whether you vocalized your rough time and feelings, or you leaned on someone for help, we’ve all had a time where we were begging for a new beginning. We didn’t always get that new beginning. God had other plans. He wanted us to see that where we are, is where we are meant to be. It was time for us to learn to walk again. I’ve been focused on one of the newest Foo Fighters songs lately, “Walk”. To get a little personal, it’s been a tough road these past couple of years. I may not have vocalized my worries, fears, or sadness to others, but I had them. I wore my smile strongly, but they were present. No, they may not be as bad as yours, or they may have been worse than yours. Only God knows that answer. It’s most important to remember it’s only natural to feel these things. You’re not a failure to have feelings. We can’t feel the life inside of us without feeling the pain surrounding us. It’s how we manage our pain, and how we get back up that makes us the individuals that we are. This site has brought me a bit of myself back. Parts of myself that I had lost. Or, maybe I hadn’t lost it. Maybe I had suppressed it to where it was easier to just coast through life untouched, unbothered, uninspired. Well, you know what? For a lack of classier words and to match my emotions…Screw that. This is life, this is MY life, and it’s time to take it back! True to the lyrics of this song below…I AM learning to walk and talk again. I’ve waited long enough. It’s the struggle of figuring out where to begin that follows. But, with all of the support you have shown and the support I have around me, I think I’ve found my beginning. Me learning to walk again...Smiling is the first step! A few lyrics from the song I think you need to enjoy. It’s time people…it’s time to be inspired and learn to walk again! 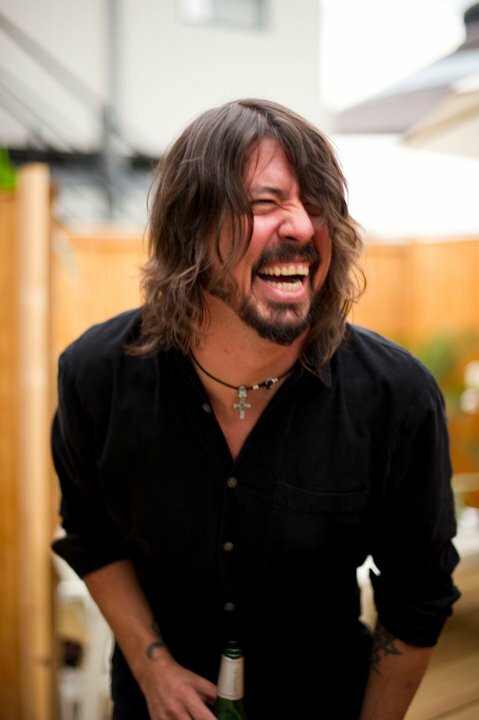 Found this picture of Dave on Facebook. He looks so full of life. I love it! You can find this recipe by scrolling down a little further. Now, it’s time for the Twitter Update for the “Will Cook for Foo” segment….. This week’s “Will Cook for Foo” comes from their song Walk. Find the previous “Will Cook for Foo” posts by clicking here. Combine the first six ingredients together in a bowl and set aside. Warm the EVOO in the Wok. Add your meat to the Wok. Towards the end of the cooking, add the sauce you mixed up previously and stir until the sauce thickens. Serve over the brown rice, white rice, or noodles. I used brown rice this time. Enjoy! Previous Post ***Updated: The Onyx Plate T-Shirts are here! This post touched my heart! Keep smiling!! Thanks, Sam! We all have those rough times. It’s accepting them and moving past them that makes us who we are as individuals. :) You keep smiling, too! Love, love, LOVE Sriracha. And this blog has your adorable anime picture in it! You would make SUCH a fantastic TV personality! I remember! It really is a wonderful kitchen item. It has become quite the staple for us!